Auxico Resources Canada Inc (AUAG) has added a NEX quotation to its year-old Canadian Stock Exchange listing. Auxico has mineral properties in Colombia and Mexico. There is already a UK investor base. Chapel Down Group (CDGP) had a bumper 2018 harvest that was 125% ahead of the previous best, thanks to the hot summer. Some vineyards produced their first crops. Ace Liberty and Stone (ALSP) is paying this year’s dividend in three instalments: October, April and July. The first interim will be 0.83p a share and the ex-dividend date is 25 October. The sale of Hume House in Leeds has been completed for £3.9m, compared to a cost of £1.67m in March 2014. A 37-storey building will be constructed on the site. Eight Capital Partners (MORE) is investing £250,000 in AIM-quoted Imaginatik (IMTK) with £160,000 subscription for shares at 1.1p a share for a 29.7% stake, and £90,000 in convertible loan notes with an annual interest rate of 7.5%. Eight Capital is issuing up to £2.5m of convertible bonds at 95% of their nominal value. The annual coupon is 5%. One warrant will be granted for every two shares issued. Trading in the shares of Etaireia Investments (ETIP) has been suspended ahead of a potential acquisition of property assets from the Oyston family. Gunsynd (GUN) will get a 4% stake in Human Brands when, or if, it floats on the standard list. Previously it would have been a 1% stake. Gunsynd has £289,000 invested in drinks distributor Human Brands loan notes. Founder Sebastian Snow has resigned as creative director of pubs and inns operator Barkby Group (BARK) and Lana Snow has also left the group. Occupancy rates were good in September and there is significant demand for the Christmas period. Ganapati (GANP) reported a reduction in interim loss from £4.54m to £3.56m, although total income was flat at £2.19m. There was cash in the bank of £2m at the end of July 2018. This could be added to by an initial coin offering by Malta-based blockchain subsidiary GanaEightCoin Ltd next spring. NQ Minerals (NQMI) has raised £81,250 at 15p a share to provide further working capital. The chairman and chief executive of DXS International (DXSP) have both bought shares in the healthcare technology company. Bob Sutcliffe bought 100,000 shares at 8.515p each, while David Immelman bought 20,538 shares at 8.66p each, which takes the chief executive’s stake to 10.3%. Sativa Investments (SATI) has signed an option on a 298,806 square foot glasshouse for growing medicinal cannabis. Mark Blower is becoming a non-executive director. Melissa Sturgess has acquired 590,000 shares in Ananda Developments (ANA) at 0.4496p each. The executive director of the cannabis-focused investment company owns 47.8 million shares. Ananda joined NEX on 4 July having raised £930,000 at 0.45p a share. The share price ended the first day at 0.975p and it has more than halved since then. Chris Marsh has resigned as finance director of Patisserie Holdings (CAKE) having been suspended on 9 October. Previously undisclosed LTIP share awards have been revealed. GB Group (GBG) has acquired Australia-based ID verification services provider Vix Verify Global for £21m. This has led to a 2.7% upgrade in the 2019-20 forecast earnings per share. Third quarter trading of the existing business was in line with expectations with organic growth in revenues of 11%. Avingtrans (AVG) is acquiring Texas-based Tecmag Inc for $243,000. Tecmag manufactures instrumentation for magnetic resonance imaging and nuclear magnetic resonance systems. This fits well with Avingtrans’ magnets business in the sector. Energy supplier Yu Group (YU.) has shocked investors with accounting changes relating to accrued income and increases in impairment charges for trade debtors. This will slash £10m for this year’s profit turning it into a loss. There is £11.5m in the bank at the end of September 2018. 1Spatial (SPA) reduced its loss n the first half and is on course to cut its full year loss from £1.5m to £1m. The geospatial data services provider should move into profit next year. HaloSource Corporation (HALO) says it has sufficient working capital until the end of the year, but up to $5m is required to add a further 12 months. The company expects to generate revenues of $2m-$2.5m in 2018 and the target is to treble that figure in 2019, which would reduce the loss. EKF Diagnostics (EKF) says the record date for the distribution of shares in Renalytix AI is 23 October and the shares will start trading on 2 November. Nexus Infrastructure (NEXS) expects 2017-18 profit to be in line with expectations and order books are strong. Infrastructure services provider Tamdown’s revenues will be slightly lower due to planning delays with the growth coming from utility connections business TriConnex. Net cash is £20m. RA International (RAI) has won a $9.1m contract with URS Group Inc. This is a new client. The contract covers construction services for an asphalt runway in Somalia and lasts for 11 months. Data analysis software and services provider D4T4 Solutions (D4T4) trebled its interim revenues to £14m, although the comparatives were weak. Net cash is £12.2m. Gfinity (GFIN) is raising £6m at 8p a share and this cash will further develop the esports activities and the UK Elite series. The 2017-18 revenues were 82% ahead at £4.3m and losses continue. Angling Direct (ANG) is taking advantage of its strong position in the fishing tackle retail market by raising £20m at 92.5p a share, which compares to the July 2017 flotation price of 64p a share. The cash will finance the opening of 20 stores and the launch of European websites. This accelerated investment means that Angling Direct will fall into loss this year. Velocity Composites (VEL) has managed to trade in line with downgraded forecasts for the year to October 2018. Revenues will be slightly above £24m and there is net cash of £3.6m. The company is seeking a new chief executive and the former incumbent has left the board. The cancellation of a contract and the failure to gain backing for an acquisition have hampered the progress of Image Scan Holdings (IGE) in the year to September 2018. Revenues fell from £5m to £3.5m, although the gross margin improved from 39% to 48%. Pre-exceptional profit will slump from £480,000 to £45,000. That was before the £245,000 cost of the failed acquisition. There was £780,000 in the bank at the end of September 2018. Sarah Atwell-King has been appointed finance director. VR Education (VRE) has been hit by the delayed launch of its Titanic VR product on PlayStation. This should still happen this year, but 2018 revenues will be well below expectations. The timing of the launch will determine the outcome for the year. The ENGAGE platform will be launched before the end of the year as anticipated. Non-executive director Mike Boyce is helping out with sales. SkinBioTherapeutics (SBTX) increased its research and development spending from £157,000 to £416,000 in the year to June 2018. The cosmetic application has started a human study and data should be available between November and April 2019. A clinical trial for an eczema treatment could start before the end of 2019. There was £3.2m in cash at the end of June 2018. Rare books trader Scholium (SCHO) says it will move into loss in the first half, but it expects to make a higher full year profit than the £38,000 reported last year. Start-up Mayfair Philatelics is losing money but three auctions are taking place in the second half. 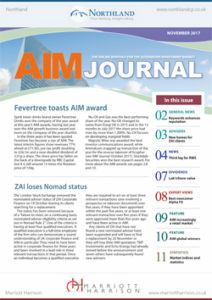 AfriTin Mining Ltd (ATM) is making progress towards production at its Uis tin project in Namibia. The first phase plant being constructed will be able to process 500,000 tonnes of pegmatite in order to produce 720 tonnes of tin concentrate a year. AfriTin has the cash required to reach production. A strong performance from manned guarding meant that Croma Security Solutions (CSSG) increased its full year revenues by 59% to £35.1m and pre-tax profit was 400% higher at £2m. There were some one-off boosts during the year. Net cash was £2.1m. The dividend has been increased from 0.5p a share to 1.6p a share. Property investment adviser First Property Group (FPO) has reduced its stake in Fprop Opportunities to 44.3% so it will no longer be consolidated in the group’s results. The plan is to lower the stake to below 30%. Fund management will be a greater contributor to profit. More cash is required at meat and delicatessen products retailer Crawshaw (CRAW) for restructuring purposes and it also still needs a new nominated adviser. Kemin Resources (KEM) will leave AIM on 29 October because it has not been able to find a replacement for Strand Hanson as nominated adviser. JP Jenkins Ltd will provide a trading facility. OnTheMarket (OTMP) has signed up Belvoir Lettings (BLV) to its online platform. All Belvoir’s sales and lettings properties will be on the platform. StatPro Group (SOG) says annualised recurring income has increased by 3% to £54.8m. Communisis (CMS) is recommending a 71p a share cash offer by consumer communications services provider OSG, which values the target at £153.8m. The combined business would be able to develop internationally because of OSG’s global strength. WideCells Group (WDC) has signed a partnership deal with stem cell extraction and storage company Smart Cells. The deal is with the healthcare insurance subsidiary CellPlan, whose insurance plans will be offered to Smart Cells’ 60,000 clients. Hemogenyx Pharma (HEMO) has signed a second agreement with US biopharma company Orgenesis Inc. The deal involves the development and commercialisation of the company’s Human Postnatal Hemogenic Endothelial Cell (Hu-PHEC) technology, which could develop cancer-free, patient-matched blood stem cells after transplantation into a patient. Like the previous agreement, Orgenesis will provide a convertible loan of $1m and this can be converted into shares in the Hemogenyx subsidiary that owns the technology. Orgenesis will pay a 12% royalty on net revenues generated by the technology. North Midland Construction (NMD) says that full year revenues will be better than anticipated at between £340m and £345m, with net margins between 1.7% to 1.8%. The order book for delivery in 2019 is £222m. A new single identity for the group will be launched in November. HR director Karen Morris has bought 8,172 shares at 550p each.